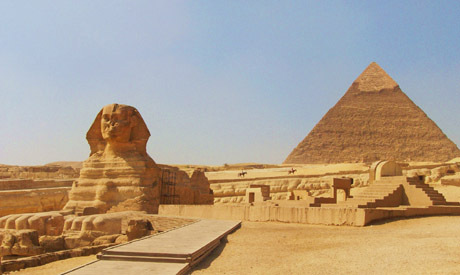 The Supreme Council of Antiquities has signed a contract with Orascom Investment to allow the latter to provide and operate the facilities at the Giza Plateau, under the supervision of the council. The signing of contract came after almost a year of negotiations, and after the approval of the cabinet, and aims to upgrade the services available to visitors to the pyramids. Mustafa Waziri, the general-secretary of the council, told Ahram Online that the facilities and services include a promotional campaign for the site, and operating the parking area located outside the archaeological site just in front of entrance on the Fayoum Road. Vehicles will be prohibited from entering the site, and the company will instead provide 20 golf carts and 30 buses for visitors, operated with renewable energy, to circulate inside the site. It will also run the services at the site visitor centre, which consists of a collection of shops, cafeterias and a cinema. “The films on display at this cinema will be revised and have the approval of the Supreme Council of Antiquities before they are shown,” Waziri said. He added that Orascom will also install 20 mobile toilets and a medical centre for first aid facilities in different areas in the plateau which would be selected and approved by the council. It will also provide new services such as mobile application for the site, free Wi-Fi services, signage, visitor maps, and kiosks for photographs and paintings of visitors. A cleaning company will be provided, as well as a security one to safeguard the services area. “The Tourism and Antiquities Police and the Supreme Council of Antiquities guards are the only ones to secure the general site, the visitors and the archaeological site,” said Waziri, adding that the security provided by the company is only to safeguard the places where services are provided. He explained that according to the signed contract the company will train craftsmen, camel and horse owners, peddlers, and photographers in order to upgrade their skills to deal with tourists and visitors, and will buy them new horse carts to replace the out-dated ones. A special place will be allocated for them, as well as a uniform. Waziri said that it is the first time such services to visitors are provided through a specialised Egyptian company in order to facilitate a visiting route inside the plateau within a complete system that respects the archaeological environment and antiquities laws and regulations. He underlined that the contract allots half the revenue from the services provided to the council. “If the company does not succeed to make any benefits, it has to pay an agreed minimum amount to the Supreme Council of Antiquities. “The Supreme Council of Antiquities has the authority to select and hire any authority to review the financial account of the company and supervise the execution of all articles in the contracts, in order to guarantee the Supreme Council of Antiquities’ rights,” Waziri said, adding that the council also has the right to end the contract at any time should the company breach any of its obligations stipulated in the contract. He added that the council is the only body that received the revenues from the tickets and bus services inside the plateau which will be part of the ticket price. The Supreme Council of Antiquities is the authority with full responsibility for the archaeological site.